Why move home when you can stay in your own home and save on moving costs and all of the hassle and stress associated with moving. Here at Prestige Stairlifts we understand that moving home can be stressful and we endeavour to keep you in the home you love by installing a stair lift to meet your exact requirements. We supply and install stairlifts for all types of staircases, many of these are bespoke in design and specially made for your unique curved staircase. We also have a wide range of products in stock ready for fitting. We offer a free consultation and offer advice on fitting with no obligation and no pressure to buy. The installation is process is quick, clean and simple because the stairlift is fitted to the treads on the staircase, not to the wall. With a range of colours, Prestige Stairlifts can be an attractive addition to your home without any unsightly alterations. Our engineers will insure the stairlift is installed exactly to the contours of your staircase. Installation is carried out by our qualified fitters at a time convenient to you. We aim to fit your stairlift as soon as possible as we realise the difference to your life that they can offer. 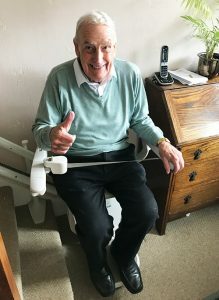 It can be possible to supply and fit your stairlift within a day of consultation. With a range of colours, Prestige Stairlifts can be an attractive addition to your home without any unsightly alterations. The installation is process is quick, clean and simple because the stairlift is fitted to the treads on the staircase, not to the wall. Our engineers will insure the stairlift is installed exactly to the contours of your staircase.